I, like many of you, see January as a time of reflection, a time to think about what I want to do more of and what I want to do less of. I am developing a number of "branches" or areas of focus this year. I'll be writing about those soon. For now, suffice it to say that one branch of my new year's tree is "order," which comes from a desire to have a clean and organized home. I hope to build on the successes of last year's 4-month purge to get things running a bit more smoothly around the household. One area that I have yet to tackle is linens - both bed linens and table linens. In looking through my linen closet recently I confess I was a bit overwhelmed with all the mismatched sheets and aging towels. (We got many of the towels and sheets for our wedding over 16 years ago!) 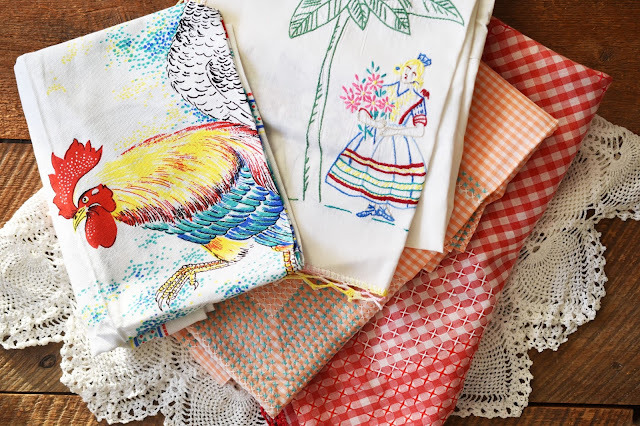 Among those less-than-appealing items, though, are vintage table linens that I cherish, mainly because they come from my grandmother. I have a few tablecloths that were hand-stitched by my grandmother, as well as some linens that are printed, like the rooster. They aren't all exactly my style (hello Mr. Rooster) but I cherish them just the same. I am eager to pare down the excess stuff in our linen closet so that only items that bring us joy remain. Or at the very least the remaining items should not be painful to look at (faded sheets anybody?). 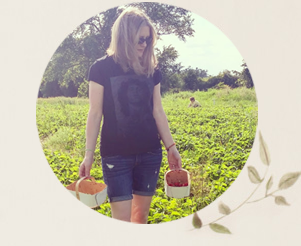 What do you have in your linen closet? Vintage beauties or mismatched and torn towels? What areas of your home will you focus on this year? My parents' house is filled with beautiful vintage Italian hand-stiched linens from my grandmother. I think some are over 100 years old! As for me and my tiny apartment, my favourite vintage store in Toronto just closed down so I just scooped up some clothes for super cheap (75% off!) and a beautiful lamp. There were actually so many beautiful lamps and I wanted to buy all of them, but I totally don't have the space, haha. I guess one of the perks of having a really small apartment is that it forces you to limit your purchases and keep decluttering as you go! I have some lovely Italian linens from my mother-in-law too. :) Too bad the store closed, but good that you got some deals. I actually need some lamps! Wish I had seen them. Those linens bring back memories! Tell us what you remember! I tend to forget the details. Don't worry I'm not throwing it out! 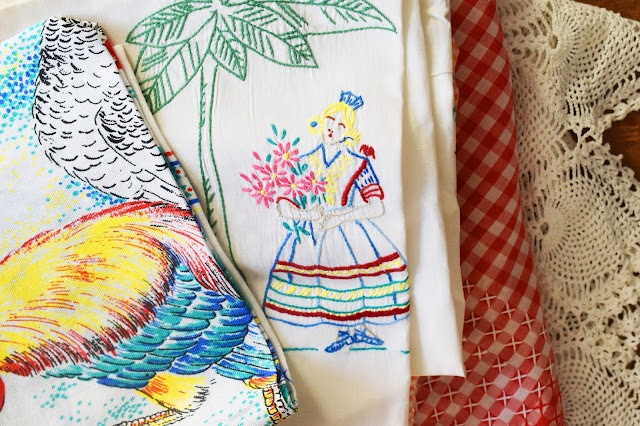 Love the vintage linens in your closet! 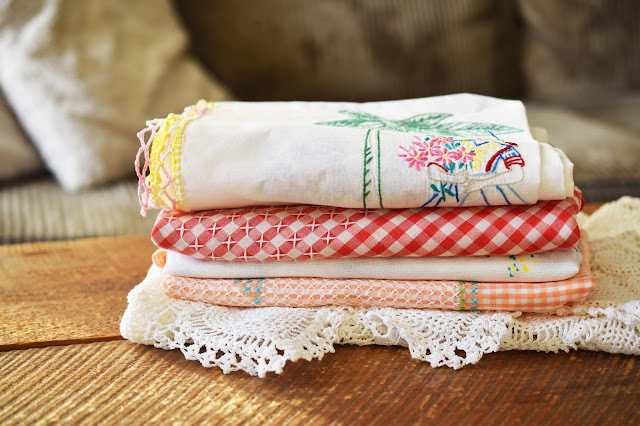 Thanks so much for sharing your beautiful vintage linens at Vintage Charm! Oh yes, I have holiday linens too! I put them in among all the Christmas stuff so I'll remember to use them come Christmas each year. I look forward to seeing your other linens Sandi! Thanks! Luckily for me, linens are not something I feel the urge to keep or collect!! You have pretty ones, though!! So very hard to let go of any vintage linens. I have used two dresser scarves to drape over a stretchy plastic covered curtain wire that is on a bookshelf. Covers the contents and looks pretty too. That just leaves several boxes of ... linens and crocheted items. What a great idea Joy!!! I love having linens and things that were my grandparents or parents. They bring back memories. As for faded sheets, let them go! LOL!